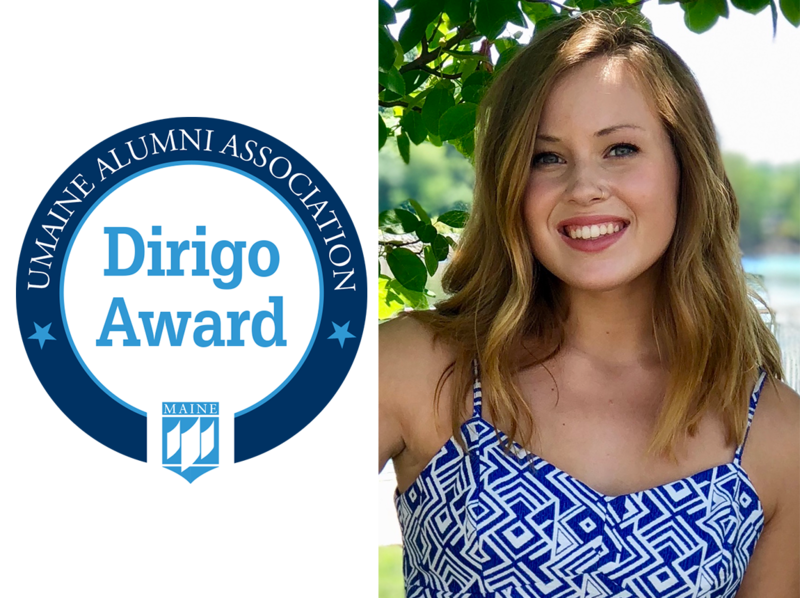 Senior Emma Brickman ’19 sat down to talk to the Alumni Association about her choices for returning to Maine, changing career paths, and how to prioritize getting involved. I am from Fort Kent, and in the past have gone home when school is not in session. For the past two summers I have spent my summers elsewhere; in 2017 I worked in Belfast over the summer, and this year I chose to stay in Orono throughout the school year and live and work here. In high school, I thought I wanted to study nursing, so I took a Certified Nurse’s Aide class at a tech school my junior year. I spent a lot of time in that field volunteering at the local hospital, doing clinical hours, and eventually working as a licensed CNA. Through this experience, I realized that nursing wasn’t my passion, but I fell in love with working with the older population. When I began college, I tried out a couple of different majors but none stuck. I found geriatric social work, and immediately realized this was the field for me. I love the flexibility of social work, and how I will be able to do the kind of work that I found my passion in. When I first graduated high school, I wanted to try something new, so I went out of state. After doing that for two years, I realized that I missed Maine and didn’t want to be anywhere else. When I transferred to UMaine, one of the attractions was how tight-knit the Social Work program is; I knew I would be getting a lot of attention from faculty, and that I would get to know my classmates well and work closely with them. Both of my grandparents were professors at UMaine so when I was very young I spent time on campus, and even though I don’t remember it, I felt a connection when I came back. Though UMaine is over 3 hours away from my hometown, the sense of community here is strong. I’m glad that I experienced living elsewhere- I enjoyed it, but it definitely solidified to me that no matter where I go, I’ll feel most at home when I come back to Maine. I am currently vice president of the Student Social Work Organization, and have also served as its treasurer and junior class representative. I’m also vice president and one of the first members of a newer campus group called Project Generations, which was founded by social work students during the 2016/2017 school year. I have been a Black Bear Mentor during my 3 years on campus as well. Buchanan Alumni House! It’s a beautiful building and there’s always a quiet place to study. I love going to the Orono Public Library. My first Maine Day! Even though it was rainy, we had a blast volunteering in the morning, attending the big barbeque, and watching the oozeball tournament. I enjoy playing guitar, reading, and spending time outdoors. I spend a lot of time with my family and friends, and I’m always looking for new places to go to, or events to experience around Maine. All of my social work professors have had a positive impact on me! In particular, Alison Mitchell has been one of my favorite professors, which is funny because I was nervous for both of her classes — social work research and policy. She stood out to me because she really cares about making sure all the students are learning in a way that works for them. She finds a way to relate it to our interests and get students engaged. I’m currently applying to graduate programs, but I’m also open to getting work experience first before getting my MSW. Once I’ve finished my education, I would love to work with older adults at a community level. Get involved! Make the most of your time here, and don’t be afraid to ask for help or put yourself out there. From my experience, everyone I’ve reached out to has been extremely supportive and repeatedly gone above and beyond to help me out with academics, extracurriculars, and planning for my future. Although you have to be realistic about managing your time, if you are able to get involved with some clubs and activities, work on campus, and/or get to know professors and other staff, it becomes a wonderful support system.